Release day for RJ Astruc’s A Festival of Skeletons! 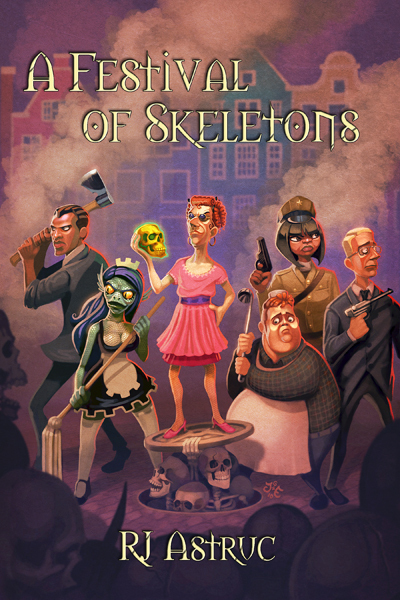 Crossed Genres is proud to officially release RJ Astruc’s novel A Festival of Skeletons! When Kamphor’s west end sees a series of prostitutes murdered, its citizens are fearful that a serial killer known as the Knife has returned. But the mortician Sink, owner of Kamphor’s finest morgue, doesn’t believe that the Knife has resumed killing – and he’d prove it, if his former student and current hateful rival Damien Torvault wasn’t getting in the way. Sink and his two apprentices, handsome-if-loony Joshua Finkle and merkind Vona Urgarth, investigate the murders on their own. Sink’s ability to tell exactly when and how a person will die just by touching them earns him no friends, but it does yield some interesting clues – as does Sink’s other gift. The one which incites him to wear women’s clothing. The investigation is further complicated when Joshua’s time is taken up running a 15-Step program, and Vona becomes intrigued by a repugnant yet strangely irresistible cook. Even Sink’s next-door neighbor, Policewoman Arifia Fowles, seems hell-bent on not just hindering Sink but arresting him, regardless of a crime. But Sink presses urgently on, because he senses a strangeness in the air: the magic-smell of necromancy, a magic that has long been illegal in Kamphor… for it requires human sacrifice. You can read the first three chapters of A Festival of Skeletons for free! * Zipped bundle contains 7 DRM-free formats: EPUB, LIT, LRF, MOBI, PDB, PDF and PRC.